All Florida lawyers under the age of 36 and Florida Bar members in their first 5 years are automatically in The Young Lawyers Division (YLD). Consequently, the division includes over 27,000 members throughout the state. As we know, new lawyers must complete the Basic Skills Course Requirement, but there have been some recent changes in how to fulfill these requirements. Furthermore, there are tremendous additional opportunities within the YLD. In this episode of The Florida Bar Podcast, Adriana Linares and Renee Thompson interview Katherine Hurst Miller, president-elect of The Florida Bar Young Lawyers Division, about online course developments, why YLD member engagement is growing, interactions with affiliate groups, and how young lawyers can get involved. Tune in to hear about the health and wellness programs coming up in the next year and how your local or specialty bar can apply for YLD grants. 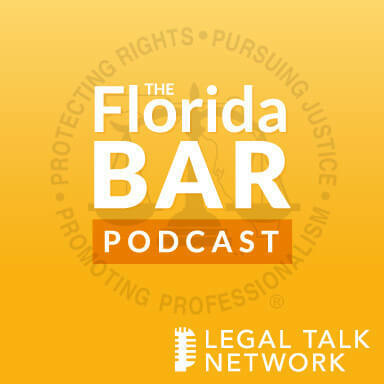 Adriana Linares: Welcome to another episode of the official Florida Bar podcast. My name is Adriana Linares and I’m your host today. I’m a legal technology trainer and consultant. I’m based in Orlando, but of course, I travel all around Florida and I’m always very honored to host one of these shows. I have a guest host today. Renee Thompson: Hi, I’m Renee Thompson. I work with the Florida Bar on their Board of Governors and I’m so excited to be here! Adriana Linares: I am too, because we have a very adorable and smart and sweet lady. Renee Thompson: She is so pretty! Adriana Linares: She is so cute. Hi Katherine! Katherine Hurst Miller: Thanks guys! glad to be here. Adriana Linares: Tell us a little bit about yourself before we tell everybody what it is that you just got elected to do. Katherine Hurst Miller: I’m Katherine Hurst Miller. I’m an attorney out of Daytona Beach, Florida. I’m a partner at the law firm of Cobb Cole at a civil litigation defense practice with a little bit of condo and HOA thrown in. I love Bar activities and just got elected or sworn in as president elect of the Florida Bar Young Lawyers Division. Adriana Linares: That’s a big job because you have how many members? Katherine Hurst Miller: So it’s me and Gordon Glover leading 27,000+ young lawyers. Adriana Linares: That is crazy! Katherine Hurst Miller: It’s so many, so many. What does it mean to be a young lawyer? That is an interesting term of art in Florida. The definition is 26 or younger or having practiced five years or fewer. Adriana Linares: So if somebody has a second career, or late career or they just took some time off and came back to the practice or never practiced, then they get to be considered a young lawyer. Katherine Hurst Miller: Yes, the first five years of practice their ours. Adriana Linares: And of the 27,000, do they have to all sign up and put a checkbox on some form that says I want to be a member of the YLD? Katherine Hurst Miller: No. I think we’re the only section of the division that you don’t sign up for. We just automatically grab you in and you’re one of ours from the get go. You’re taking our practicing with professionals, and of course, you’re taking our three basic skills courses in your first three years of practice. And so you’re ours for those first beginning years. Renee Thompson: And with them practicing with professionalism course, I saw recently that the Florida Supreme Court made some big changes in that. Can you tell our listeners about that? Katherine Hurst Miller: Big news, we’re very excited. A few years back, our board studied this really extensively, presented a proposal to the Board of Governors, and we petitioned the Florida Supreme Court to allow us to practice with professionalism online. So in the past, it’s been all required to show up in person, and the problem is our courses fill up and folks are flying across the state or going to places that are inconvenient or missing their dates and really struggling to get in that class. So we’re going to be developing an online platform, but it’s not just a video replay. We’re working really hard, we’re really excited. We’re still in the development stage of this right now. So if you just graduated law school, you’ve still got to go take your PWP online, but we are working to create an interactive eight hour video that maybe you can watch in segments or that you can sit down and watch in one day and feel that you’ve really gotten educated on beginning your career starting off from a place of professionalism and knowledge. Renee Thompson: Boy, that technology will really help your members. Having to fly to whatever program across the state to get that requirement I’m sure is a burden for some of those folks. So this will be a great enhancement! Great, congratulations on that. Katherine Hurst Miller: Thank you, we’re excited. This has been a year of technology for us. Our immediate past president, Michael Fox, loved technology. Gordon Glover and I love technology, and we’re going to try to use it as much as we can for the benefit of our members. One thing we did last year and I think we’re going to continue this this year is our webinars. They were a very successful series. We had thousands of people logging on to free lunchtime webinars and that is a benefit for our members but we’re not checking cards at the door to make sure you’re 36 or under or five years and under. The Bar is invited. Everyone is invited to these lunchtime webinars. We’ll be publicizing them again, they’ll be free this year. Adriana Linares: And what types of topics have you had an you plan to have? Katherine Hurst Miller: So because it’s a technology platform, we’ve had technology topics. Adriana Linares: Excellent, I love those. Katherine Hurst Miller: I think we’ve had you on them in the past. We’re talking about anything about social media and how lawyers can use social media, the ethics rules about social media, we’ve done that. And I think there will still be a technology focus. We may offer some others as well going forward. Renee Thompson: They have a great focus this year too on all the member benefits that are associated with technology. For our listeners, if you haven’t already checked it out, what those member benefits are, Florida Bar has approved multiple technology benefits within the past year and the Young Lawyers is going to do a focus on what those benefits include from a standpoint of what those providers do. So, for instance, if you have a platform that does Cloud computing, what does that mean to you in your practice. So it’s really exciting times to talk about these webinars and they’re all free. Adriana Linares: Good job, YLD. Adriana Linares: What are some of the other things you’re excited about leading the charge? Katherine Hurst Miller: So I’m kind of a touchy feely in person person. I love technology. Actually I don’t like to be touched in personal space at all, we were talking about this earlier. I like some personal space, but I like the warm and fuzzy projects, and the YLD is really full of those. We are offering grants to our affiliates. Our affiliates are those groups of young lawyers that may be affiliated with a local Bar association or a specialty Bar association. So in my area, the Volusia County Bar Association Young Lawyers Division, or the Orange County Young Lawyers Section, or the Caribbean Bar that we have over fifty affiliate groups across the state and we give them the opportunity to compete for grant money. So we have grants for professionalism events. Grants for morning or afternoon in the courthouse tour. So the very newest, youngest lawyers can get connected with the legal communities specific to where they are, the judges and clerks of courts specific to where they are. We also have the community service pro bono grant that’s focused on children. And those three grants have deadlines in early October, October 2nd. We also do diversity grants in the Spring. This past year, we surveyed young lawyers and their number one concern wasn’t jobs, it wasn’t money, it wasn’t promotional opportunities or the future of law. It was health and wellness type of issues. Work, life, balance is the number one concern when we surveyed a statistically accurate sample. Adriana Linares: That’s so interesting because everybody likes to say lawyers are worried they don’t have enough work, there’s too many lawyers. But your study found otherwise. Katherine Hurst Miller: Very important to the young lawyers. And so we offered this past year, we partnered with Share Care and gave away grant money for our affiliates to do health and wellness programs. We had panel seminars on health and wellness, we had one affiliate did a tee, several affiliates did paddleboarding. One of our favorites with sweat working. The Broward County Young Lawyers had a networking event set up at a gym where they all split up into different rooms, four or five rooms. If you wanted to do yoga, you could do yoga. If you wanted to do intense spinning, you could do spinning, mayze Zumba. I forget all the classes they offered. And at the end, the different groups came together and had cucumber water and granola bars. Adriana Linares: Good lord, where’s the tequila? Katherine Hurst Miller: So it was combining things and I love combining things. Adriana Linares: You crazy young lawyers trying to be healthy! Katherine Hurst Miller: They were huge hits! And so we’re going to continue that grant again this year and so that will be with our health and wellness month in May. And then the final thing for affiliates, the really big thing, is our affiliate outreach conference coming up next January. Renee Thompson: Before we get to that, where do you find these applications for these grants? Because if I’m an affiliate leader in Florida, I want to know how to get on board with this funding. Katherine Hurst Miller: Yes, we just finished our website, FLAYLD.org, and there’s an affiliate section. So if you scroll to the bottom – in the redoing of our website now the tabs are at the bottom – scroll to the bottom for the tabs, find affiliates. There’s how to become an affiliate if you’re not already one. There’s a list of affiliates to make sure you are one. There’s our grant opportunities, there’s information about this conference and all the other things that the YLD is doing. Our website is a great resource for that and I highly recommend it specifically for affiliates. FLAYLD. Renee Thompson: And is that where you find out about this affiliate outreach conference? Katherine Hurst Miller: Yes, I think it’s going to go on the very front page of our website so that may not involve too much scrolling and searching because we’re very excited about it, we really want to promote it. It’s going to be in St. Augustine the 14th through 16th. Our hotel will be at the Casa Monica where again, affiliates will get to come, they’ll do live grant presentations. We’ll be talking about grants for events they want to put on. It can be either member focused benefiting young lawyers, or community focused benefiting folks out in the community with kids. Last year, one that was incredibly impactful was the Lee County Bar Association was buying beds for kids in foster care. Apparently, you can not be relocated to a new home without a bed. So maybe a grandma or aunt or uncle wants to take care of a child who’s been removed from their parents and they need a bed for that child to be able to be in the house. And they got this incredible deal to get beds. Anyone that’s shopped for children’s bedding and beds recently. So they’re getting these beds and sheets and pillows for $250 and they’re helping set them up and install them and get them ready to go out to people’s homes so the kids can be somewhere safe and protected in a wonderful bed and we just loved it. They got $3,000 of grant money to go do this and so that’s like a dozen kids that are going to get beds in the foster care where they’re needed. Renee Thompson: One of the things I’ve noticed is we have a lot of young lawyer affiliate leaders here this year at the Voluntary Bar Leaders Conference, and that’s something new. Normally we see Bar presidents from specialty Bars or maybe from a voluntary Bar. But this year, we’re seeing a lot more young lawyer presidents. Can you tell us why you think that might be? Katherine Hurst Miller: I think young lawyer leaders are really stepping up. The affiliates are really active. They’re just chock-full of events and so I’d encourage folks to go get involved in their local Bar because they’re really doing great things. And I think the conference this year has made an effort to have some more programming for young lawyers. We’ve offered some scholarships. The Florida Bar Young Lawyers Division has helped fund some folks to come here and we’d like to continue to do that. And we’re even talking to see if the Voluntary Bar Leaders Conference wants to develop a track with very specific programming, a whole series of programs that might be for the young lawyer or young lawyer affiliate. Renee Thompson: That’s so important as a young lawyer leader to not only have the support of a leadership conference like this on the front end of your year, but then to be able to go to the Affiliate Outreach Conference mid year to meet with all your fellow young lawyer presidents and find out what’s going on from a grant standpoint, what’s going on from a programming standpoint. That’s a tremendous benefit that not a lot of Bars offer, so I really commend the young lawyers for what they’re doing in that regard. Adriana Linares: I have a question. If I’m a young lawyer and I want to get involved with leadership and just becoming a part of the bigger picture of the Young Lawyers Division, how do I do that? Katherine Hurst Miller: Special projects, or serving on or practicing with professionals on a panel. We have speaking opportunities or organizational opportunities that I really encourage folks to get on. And then finally, if you’re interested, I would encourage you to run for a seat on our board. The seats come up every two years depending upon your area and we have a fifty person board governing the young lawyers, representatives from each and every circuit. Renee Thompson: Where are those advertised? Katherine Hurst Miller: So those come out in the Florida Bar news. You’ll see around November or December that there are going to be openings or who’s running for their seat or which seats are open that year. So even numbered seats open and even years and odd numbered seats open. So if you’re from the 7th Circuit like I am, that seat you run for in an odd numbered year. And so again, you have to be a young lawyer to run for the seat and then it’s voted on by members of your circuit, the young lawyers in your circuit. And serving on this board is just one of the amazing privileges I have. I love it, that’s why I ran for president, but the board service is incredible and the connections you make across the state are amazing. Renee Thompson: They’re dynamic individuals. Adriana Linares: You know, we didn’t recognize you, Renee, as a past president of the YLD. Katherine Hurst Miller: Renee was a president when I joined! She was one of our very impactful members. Adriana Linares: Yeah! And I guess that’s a step on to higher levels, because now, Renee, you’re a member of the Board of Governors on our many committees. So for the young lawyers out there who really want to get involved in Florida Bar leadership, that’s obviously a great way to get started and get involved. Renee Thompson: It’s an incredible opportunity for young lawyers to learn not only leadership skills but to find a place in the Bar at a very early stage of their profession. Adriana Linares: Alright everyone, well that’s another wrap of a great episode of the official Florida Bar Podcast. We hope you enjoyed this one and listen to some more!